Economic growth in India is much weaker than China. India's economy grew by 4.6% in the first three months of the year, well below what many consider optimal for the emerging market country. The disappointing number, released Friday, underscores the challenge facing India's newly-installed Prime Minister Narendra Modi as he takes over Asia's third biggest economy. Meanwhile, investors have been optimistic that Modi will be able to pull India through its malaise. The Indian rupee has strengthened almost 5% so far this year. The benchmark Mumbai Sensex index has increased by nearly 15% over the same period. Related: Can Modi make India the new China? India's growth potential was once mentioned in the same breath as that of China. But the world's biggest democracy has failed to deliver, and its economy is just a fifth the size of its Asian rival. 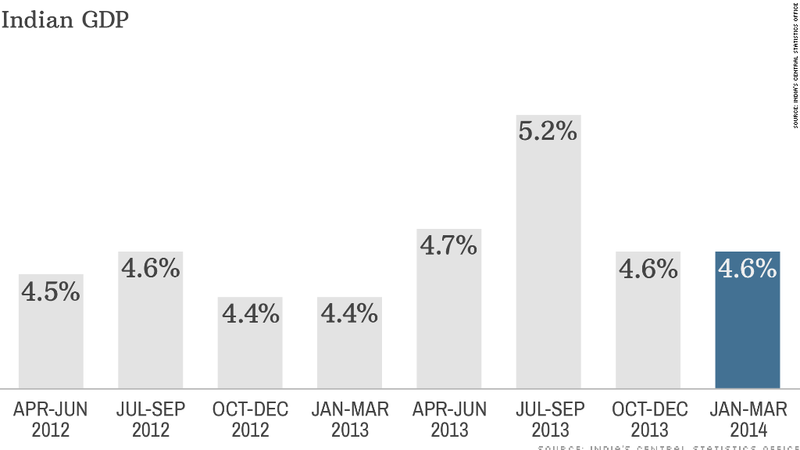 China's economy grew by 7.7% in the first quarter of 2014. In India, structural reforms have fallen foul of political gridlock. Analysts say India needs to simplify its tax code, encourage foreign investment and streamline agricultural production. Modi will have to move fast. Modi likes to emphasize his management credentials. He campaigned on a record of low unemployment and high foreign investment in Gujarat, the state he led since 2001. He has promised to end policy paralysis, reduce inflation and tackle corruption. He also pledged to establish manufacturing hubs and industrial corridors, improve the tax code and reform the banking sector. The campaign was so successful that voters gave his Bharatiya Janata Party a majority in the lower house of parliament, sparing Modi the hassle of a coalition. Still, the BJP will face opposition from the Congress Party and other rivals in the upper house.